OK, I’ve booked a space at the Conwy Honey Fair, and I’m selling for the first time. How do I sell my honey with maybe 25 other honey sellers nearby? Make your stall stand out from the rest. An inviting display will always attract buyers. A plain table with just one type of honey and one size of jar will attract less interest. The sign of a great day is when you’ve sold all your jars of honey, and a buyer wants to buy your nearly-empty taster jar. Show some pictures of your apiary. We’ve all got clear honey in mid September. Customers will be asking for set honey, heather honey and chunk honey. Plan ahead for next year. A silver cup, rosettes and prize cards from Eglwysbach and Llanrwst Shows and especially the Royal Welsh Show are the best props. You will have a marketing advantage straight away. Plan ahead and save some honey for next year’s Shows. Be a winner. Offer other hive products, not just honey. Candles, beeswax, creams, fudge etc. Cut comb honey sells well at the Fair. Thorne’s sell a great cut comb container. A glass-fronted observation hive with live bees always attracts the crowds. In 2016, four stallholders brought observation hives to the Honey Fair. Make sure they are clamped to your table. Be willing to talk about your bees. 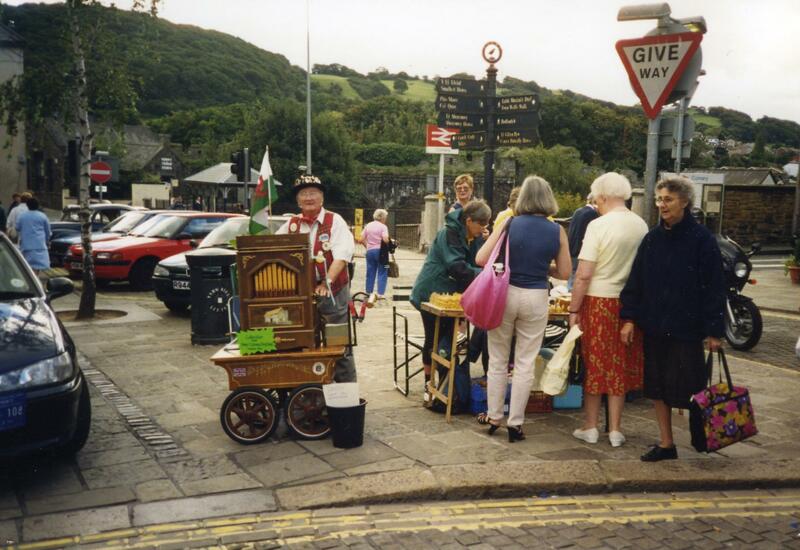 If you are new to Conwy, bring some props to make your stall more eye-catching. Settling down in the High Street with a comfy chair and a good book will not help your sales. Remember, you are here to do business. Bring plenty of change. There are no banks in Conwy town. Most important, remember that the Honey Fair is a unique privilege for us.